Even though adding the fuselage top is early in the construction process (at least according to the manual), doing this was something that I put off for a long time. 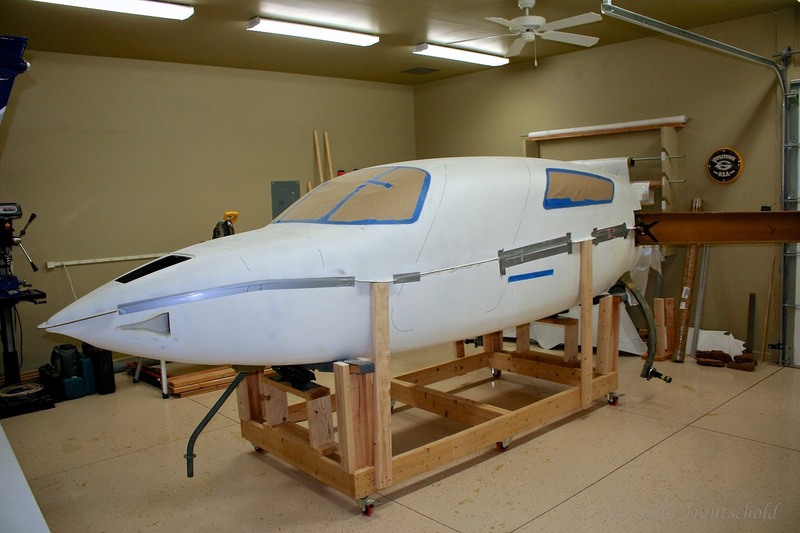 Most builders and the factory recommend that as much of the internal mechanical work as possible be completed in the lower fuselage before putting on the top. Smart advice! It’s much easier to work on that stuff with full access to the lower fuselage! I’ve just started the process of installing the top of the fuselage. The first step was to do a test fitting (which worked perfectly, thank goodness) and then to begin the process of epoxying the top and bottom together. It starts with attaching the aft end of the upper fuselage to the engine bulkhead. A mixture of structural epoxy and flox is used for that. Once it cures, I need to temporarily hold the top to the bottom, create some temporary holes where the doors eventually go, then climb inside and start the process of filling in the gaps with EX-Poxy and Microballoons along with BID layups. Hey - it's finally starting to look like an airplane! No, the duct tape you see above isn’t meant to hold the fuselage together! Ha ha! 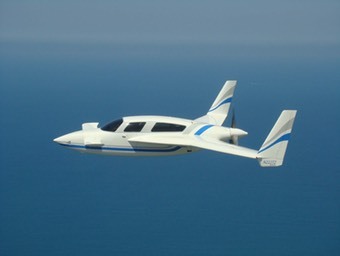 But, it is meant to hold the EZ-Poxy/Micro-balloon mixture inside of the pre-molded groves between the fuselage halves. That’s the yellowish stuff you see in the photo below. Once that mixture is smooshed into the groove, a couple of BID lay-ups are placed over it to lock that mixture in place and also to provide for strengthening for the joint. Eventually a couple more BID lay-ups are done on the outside along the seam. When totally cured and finished, you won’t even see the seam. 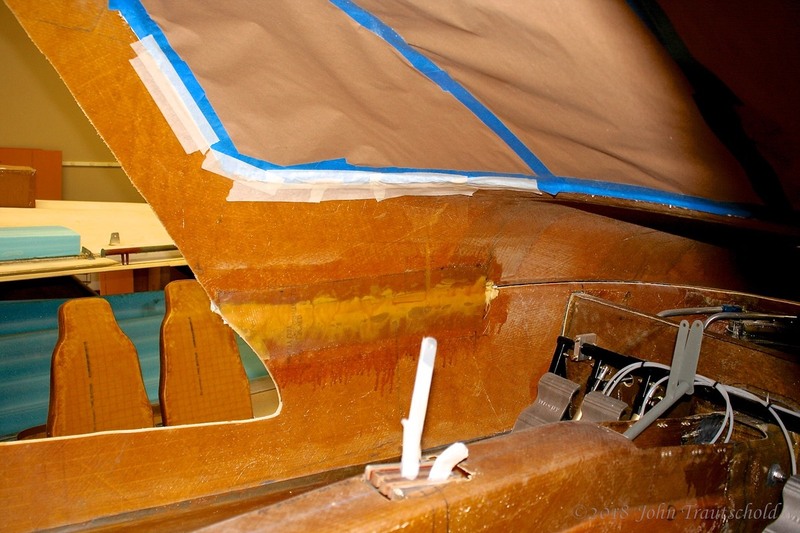 Fiberglass strips and epoxy are used here to help mate the upper and lower sections together. You may ask why the lay-up in the photo below doesn’t go all of the way to the nose. A part of the upper fuselage called the “dog house” gets cut out. This opening is where the canard goes. Although not shown in this photo, I did complete some lay-ups internally in the nose section. Because it’s so tight in there it’s hard to get a photo. 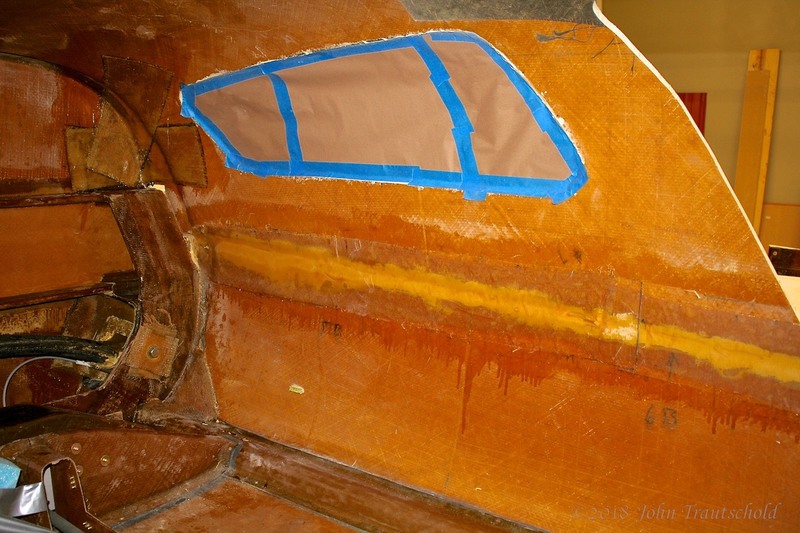 Here's another photo showing an internal lay-up for the front of the cabin. Additional triax lay-ups are required in the aft end of the fuselage not only to help lock the upper fuselage in place, but also to provide additional strengthening for the eventual installation of the engine mount. The large lay-ups in the corners and at the top center not only help hold the fuselage to the engine bulkhead, but are also strengthening points for the engine mount. Here’s an outside view after all of the internal lay-ups are finished. I still need to finish removing the tabs along the seam but I had to get the fuselage off of the carriage and onto its own wheels first. And here it is actually on its landing gear for the first time! Yay! Yes, the rear wheels are bowed in, but that’s normal until the weight of the engine helps to spread out the landing gear legs. Also, the wheels back there are only temporarily installed with Home Depot hardware. More work needs to be done on the landing gear and I didn’t want to destroy the good, expensive, hardware. Here's what the finished seams look like from the outside before adding more fiberglass lay-up to bond it all together strongly. The photo below shows what the external seam lay-ups look like. 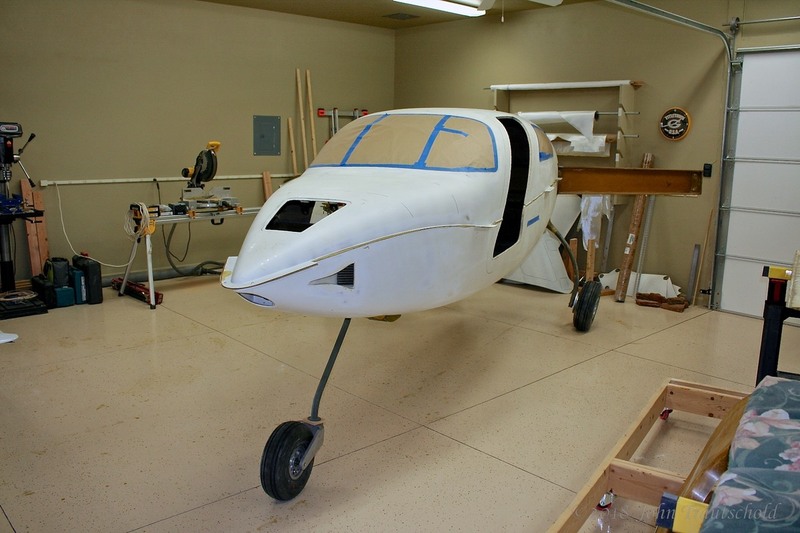 I started to do some preliminary finish work on the nose of the fuselage, as you can see below. Those lay-ups on the left side get coverd up with the wing strakes so those lay-ups will never get seen. 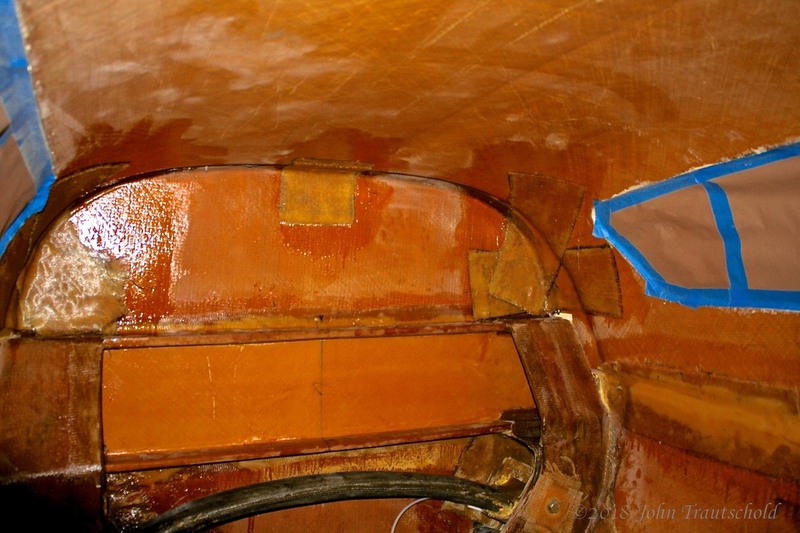 Plus, part of that area also needs to get sealed with a special epoxy mixture for the fuel tanks. 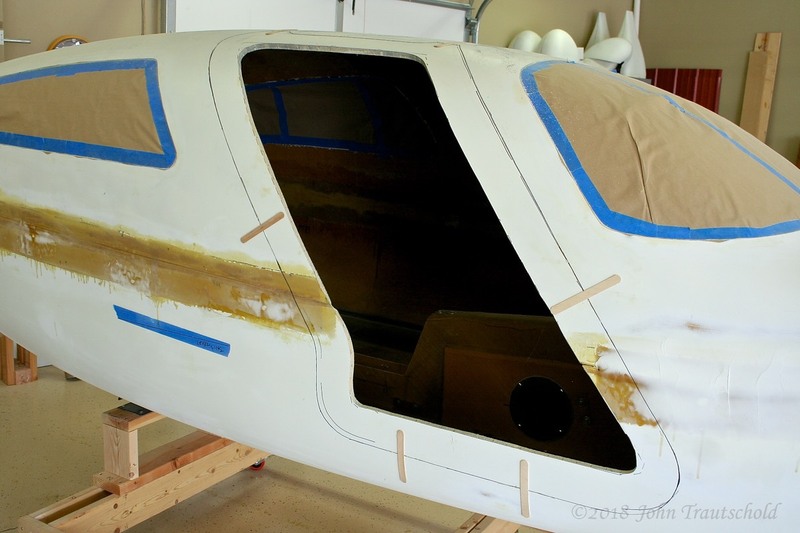 Now that the fuselage halves are mated together, the next step is to start on the installation of the doors. See Section 5.2.2 for that process. In fact, the photo above shows part of that process which is discussed in the next section.